In this lecture ´´Statistical Tests´´ are explained. Section one is about ´´Basic Concepts´´. 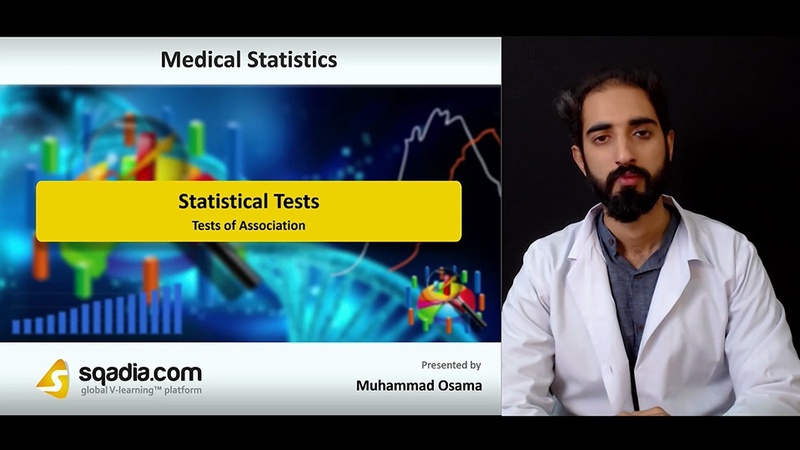 Educator initiates this section by explaining samples and population. Also gives information about dealing with uncertainty. Then discussion continues on sampling distributions. Following this, sampling distribution of the mean is elaborated. Standard error of the mean is the next focus. Furthermore, choice of percentage for confidence intervals (CI) is covered in this part. Afterwards, educator notify about calculating the confidence interval (CI). Then standard error of a proportion comes under consideration. Likewise, educator precisely continues discussion on question that how to interpret confidence interval for a proportion. Moving onward, information about large sample is given. Alongside, P - value is elaborated. Reporting P values is explained in the proceeding slide. Next, statistical significance is covered by the educator. Finally, clinical significance is highlighted. Section two is about ‘’Parametric Tests of Significance’’. In the beginning, educator comparatively explains parametric vs non-parametric tests. After that thoroughly discuss parametric tests. Then independent T-test is elaborated. Following this assumptions for independent T-test is given. Likewise, educator tells how to apply independent T-test. Furthermore, interpretation of independent T-test is reported. Paired T - test is also elucidated in this part. Subsequently, discussion continues on how to apply paired T-test. Then educator also notifies how to apply and interpret paired T - test. Moving onward, one way ANOVA comes under consideration. assumptions of one way ANOVA are focused afterwards. The next subject is the elucidation of how to apply one way ANOVA. Moreover, interpretation of one way ANOVA is given. Concluding comments are given on Repeated Measures ANOVA. Section three is about ‘’Non Parametric Tests of Significance’’. Firstly, parametric vs non parametric tests are discussed. In the next slide, Mann Whitney U Test is elaborated. Following this, assumptions for Mann Whitney U Test is given. Then discussion continues on how to apply Mann Whitney U Test. Additionally, interpretation of Mann Whitney U Test is reported. Wilcoxon signed rank test is also covered under this part. Furthermore, assumptions for Wilcoxon Signed Rank test are highlighted. Educator thoroughly explains how to apply Wilcoxon Signed Rank Test. This is followed by interpretation of Wilcoxon Signed Rank Test. Next is the elucidation of Kruskal Wallis H Test. Likewise, assumptions for Kruskal Wallis H Test are reported. Later on, explanation is given on how to apply Kruskal Wallis H Test. Finally, educator highlights interpretation of Kruskal Wallis H Test. Section four is about ‘’Tests for Correlation’’. Educator begins by telling about parametric vs non parametric tests. Then moves to elucidation of Pearson’s product-moment correlation. Next few slides focus on assumptions for Pearson's Correlation. Moreover, educator talks about how to apply Pearson's Correlation. Likewise, interpretation of Pearson's Correlation is elaborated. Moving onward, Spearman's Rank-Order Correlation comes under consideration. After that assumptions for Spearman's Rank-Order Correlation are pursued. The next theme of discussion is how to apply Spearman's Rank-Order Correlation. In the end, interpretation of Spearman's Rank-Order Correlation is covered by the educator. Section five is about ‘’Tests of Association’’. Earlier in this section, parametric vs non-parametric tests are elaborated. After that Chi-Square Test for Association is pursued. This is followed by assumptions for Chi-Square Test for Association. Then discussion continues on how to apply Chi-Square Test for Association. Later on, interpretation of Chi-Square Test for Association is reported. Next, Chi-Square Goodness of Fit Test is focused. Moreover, assumptions for Chi-Square Goodness of Fit Test are given. Likewise, educator gives information on how to apply Chi-Square Goodness of Fit Test. Concluding comments are given on interpretation of Chi-Square Goodness of Fit Test.